This is a great looking Harley Davidson 3/4 helmet. Part way in between a full face helmet and a half-stock helmet, the 3/4 helmet is a good compromise. Weighing in at less than three pounds, it is made with a durable safety fiberglass shell. It features a standard D-ring chin strap. On the front is the traditional bar and shield logo, but this time it's in the form of an air vent. It has a replacement shield designed in either clear or smoke, and a helmet bag is included. Naturally, it meets all DOT requirements. 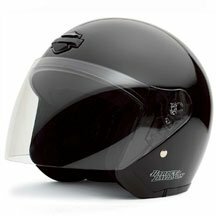 This helmet is sought after and right in style in the motorcycle world, with its light weight and black, glossy shine.